Traffic Manager includes a range of traffic-routing methods that allow you to control how Traffic Manager chooses which endpoint should receive traffic from each end user. For more information, see Traffic Manager traffic-routing methods. Each Traffic Manager profile specifies a single traffic-routing method. However, there are scenarios that require more sophisticated traffic routing than the routing provided by a single Traffic Manager profile. You can nest Traffic Manager profiles to combine the benefits of more than one traffic-routing method. Nested profiles allow you to override the default Traffic Manager behavior to support larger and more complex application deployments. The following examples illustrate how to use nested Traffic Manager profiles in various scenarios. Suppose that you deployed an application in the following Azure regions: West US, West Europe, and East Asia. You use Traffic Manager's 'Performance' traffic-routing method to distribute traffic to the region closest to the user. Now, suppose you wish to test an update to your service before rolling it out more widely. You want to use the 'weighted' traffic-routing method to direct a small percentage of traffic to your test deployment. You set up the test deployment alongside the existing production deployment in West Europe. You cannot combine both 'Weighted' and 'Performance traffic-routing in a single profile. 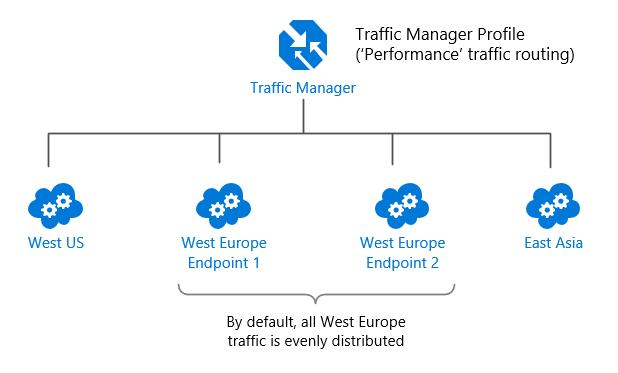 To support this scenario, you create a Traffic Manager profile using the two West Europe endpoints and the 'Weighted' traffic-routing method. Next, you add this 'child' profile as an endpoint to the 'parent' profile. The parent profile still uses the Performance traffic-routing method and contains the other global deployments as endpoints. In this configuration, traffic directed via the parent profile distributes traffic across regions normally. Within West Europe, the nested profile distributes traffic to the production and test endpoints according to the weights assigned. When the parent profile uses the 'Performance' traffic-routing method, each endpoint must be assigned a location. The location is assigned when you configure the endpoint. Choose the Azure region closest to your deployment. The Azure regions are the location values supported by the Internet Latency Table. For more information, see Traffic Manager 'Performance' traffic-routing method. Traffic Manager actively monitors the health of each service endpoint. If an endpoint is unhealthy, Traffic Manager directs users to alternative endpoints to preserve the availability of your service. This endpoint monitoring and failover behavior applies to all traffic-routing methods. For more information, see Traffic Manager Endpoint Monitoring. Endpoint monitoring works differently for nested profiles. With nested profiles, the parent profile doesn't perform health checks on the child directly. Instead, the health of the child profile's endpoints is used to calculate the overall health of the child profile. This health information is propagated up the nested profile hierarchy. The parent profile uses this aggregated health to determine whether to direct traffic to the child profile. See the FAQ for full details on health monitoring of nested profiles. Returning to the previous example, suppose the production deployment in West Europe fails. By default, the 'child' profile directs all traffic to the test deployment. If the test deployment also fails, the parent profile determines that the child profile should not receive traffic since all child endpoints are unhealthy. Then, the parent profile distributes traffic to the other regions. You might be happy with this arrangement. Or you might be concerned that all traffic for West Europe is now going to the test deployment instead of a limited subset traffic. Regardless of the health of the test deployment, you want to fail over to the other regions when the production deployment in West Europe fails. 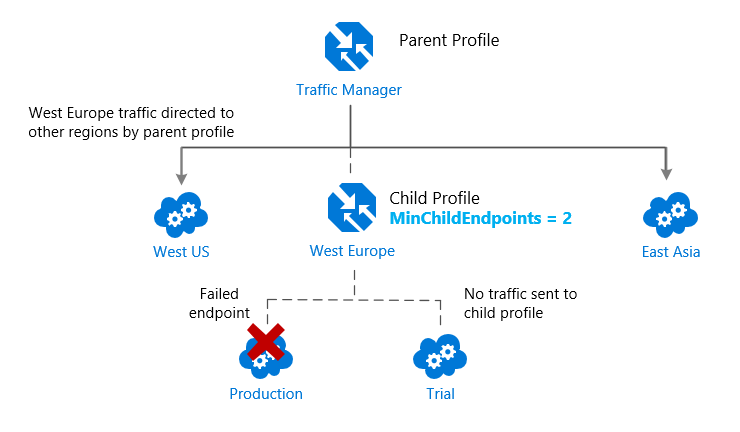 To enable this failover, you can specify the 'MinChildEndpoints' parameter when configuring the child profile as an endpoint in the parent profile. The parameter determines the minimum number of available endpoints in the child profile. The default value is '1'. For this scenario, you set the MinChildEndpoints value to 2. Below this threshold, the parent profile considers the entire child profile to be unavailable and directs traffic to the other endpoints. The 'Priority' traffic-routing method distributes all traffic to a single endpoint. Thus there is little purpose in a MinChildEndpoints setting other than '1' for a child profile. The default behavior for the 'Performance' traffic-routing method is when you have endpoints in different geographic locations the end users are routed to the "closest" endpoint in terms of the lowest network latency. However, suppose you prefer the West Europe traffic failover to West US, and only direct traffic to other regions when both endpoints are unavailable. 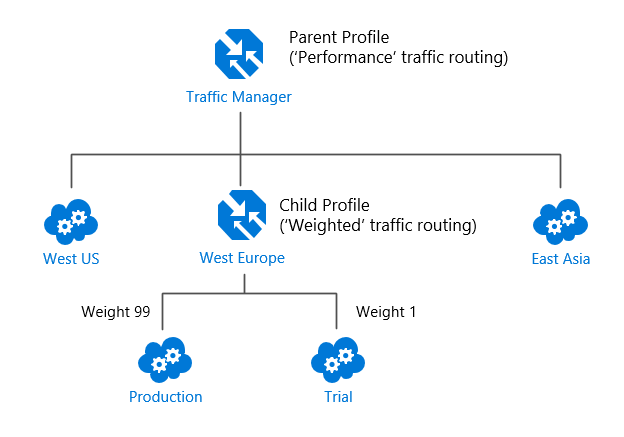 You can create this solution using a child profile with the 'Priority' traffic-routing method. 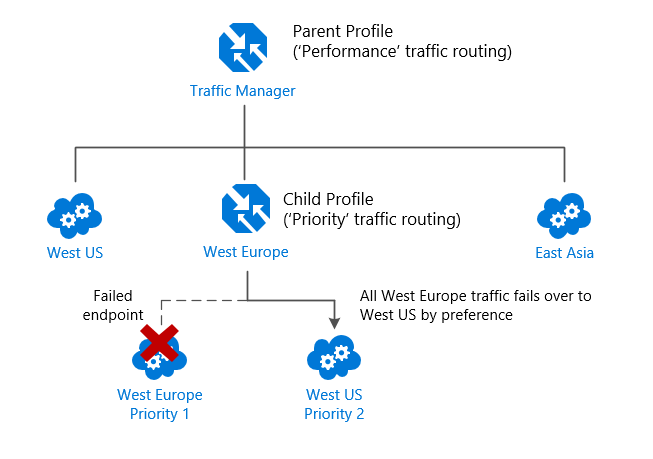 Since the West Europe endpoint has higher priority than the West US endpoint, all traffic is sent to the West Europe endpoint when both endpoints are online. If West Europe fails, its traffic is directed to West US. With the nested profile, traffic is directed to East Asia only when both West Europe and West US fail. You can repeat this pattern for all regions. 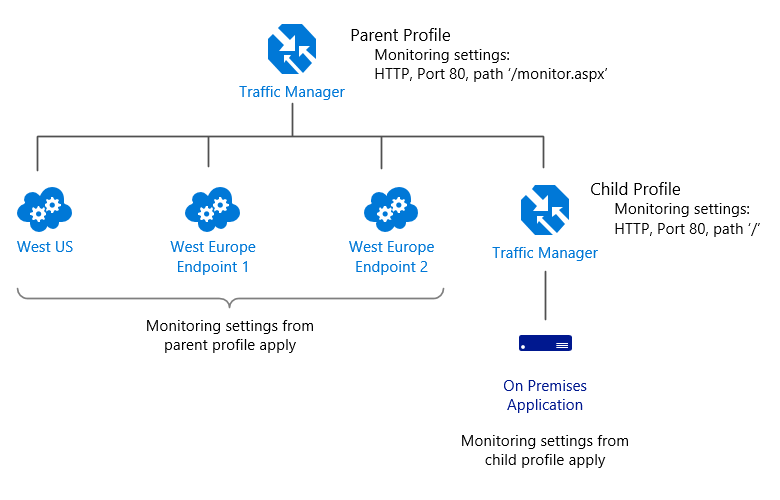 Replace all three endpoints in the parent profile with three child profiles, each providing a prioritized failover sequence. Suppose the 'Performance' traffic-routing method is used in a profile that has more than one endpoint in a particular region. By default, traffic directed to that region is distributed evenly across all available endpoints in that region. 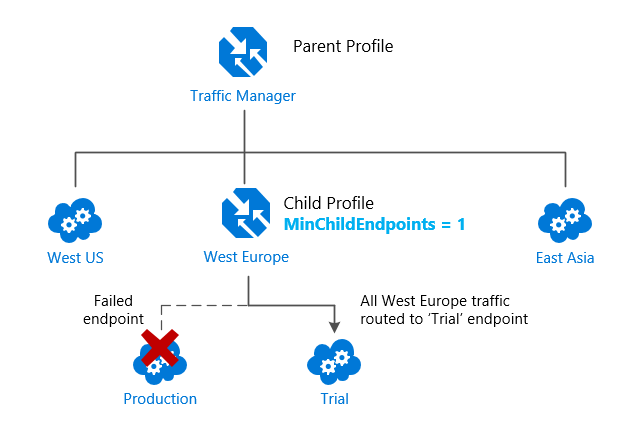 Instead of adding multiple endpoints in West Europe, those endpoints are enclosed in a separate child profile. The child profile is added to the parent as the only endpoint in West Europe. 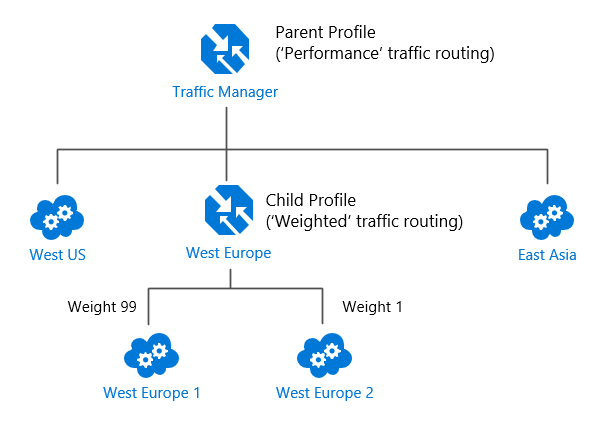 The settings on the child profile can control the traffic distribution with West Europe by enabling priority-based or weighted traffic routing within that region. Suppose you are using Traffic Manager to smoothly migrate traffic from a legacy on-premises web site to a new Cloud-based version hosted in Azure. For the legacy site, you want to use the home page URI to monitor site health. But for the new Cloud-based version, you are implementing a custom monitoring page (path '/monitor.aspx') that includes additional checks. 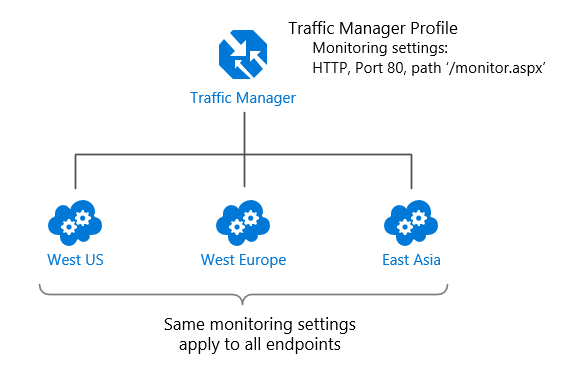 The monitoring settings in a Traffic Manager profile apply to all endpoints within a single profile. With nested profiles, you use a different child profile per site to define different monitoring settings.